SPAIN’S NEW PRIME Minister has ordered authorities to allow a rescue ship carrying 629 migrants to dock in the eastern port of Valencia after the boat was refused by Italy and Malta. The migrants were left at sea as a diplomatic standoff reached its second day under Italy’s new anti-immigrant government. It is our duty to avoid a humanitarian catastrophe and offer a secure port for these people. Amid the political dispute, The Aquarius, a rescue ship belonging to the SOS Mediterranee charity, has been stuck in the Mediterranean Sea with its passengers, including 123 unaccompanied minors and seven pregnant women. Medical workers say food onboard the ship is going to run out tonight. The government statement said Spain wanted to comply with its international responsibilities on humanitarian crises. The ship said it had been ordered by Italy’s coast guard coordination centre late last night to remain 56 kilometres off Italy and 43 kilometres from Malta. Doctors Without Borders, which has staff aboard the Aquarius, tweeted a video of some of the women aboard the ship praying this morning and said they were unaware of the diplomatic drama being waged on land over their fate. Marco Bertotto of Doctors Without Borders also told Italian state TV that some of the 629 migrants aboard the Aquarius have water in lungs after falling into the Mediterranean Sea from smugglers’ boats. Others have burns from boat fuel mixed with seawater or are suffering from hypothermia. The standoff marked the first inevitable clash over migrant rescues with League leader Salvini, now running Italy’s interior ministry. 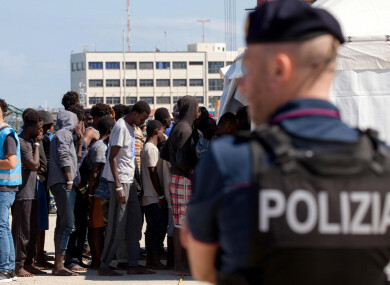 Salvini campaigned on an anti-immigrant platform that also included a vow to expel hundreds of thousands of migrants already in Italy, even though experts doubt such mass deportations are feasible or financially viable. “Italy has stopped bowing our heads and obeying,” Salvini said in a Facebook post. Email “Spain allows stranded rescue boat with over 600 migrants, including 7 pregnant women, to dock ”. Feedback on “Spain allows stranded rescue boat with over 600 migrants, including 7 pregnant women, to dock ”.